When Utopia first came out last year, Tobie and I were pretty blown away. It was a show that felt totally original and was quite gripping at that. And as much as there was quite an amount of violence on the show (some of which involved young children), the visual treatment of the show helped keeps things from falling into a deep hole of gratuitous violence or something. I have to admit that I wasn't sure if a second series for the show would be commissioned. Utopia isn't exactly the kind of TV experience that you expect a horde of viewers to latch onto. But for one reason or another the show survived to continue on with another batch of episodes and fans like us were pretty thrilled with the idea. And given how things had ended in the first series, it was anyone's guess as to where the show would go next. I suppose Utopia's appeal sort of depends on the strength of its storytelling and just how starkly beautiful its visuals are. It's a show with a very dark story but one with very clever use of bright, vibrant colors. And so more than just a show that exercises your mind as you try to keep up with the twists and turns of this global conspiracy, you also get quite the visual feast for your eyes with a rich musical score to go with things, too. Synopsis: Utopia is a conspiracy drama TV series created by Dennis Kelly and airs on Channel 4. The second series ran from July-August of this year and is supposedly confirmed for a third and a fourth series as well. Spoilers for Series 1 below. By the end of the first series, it was pretty easy to answer the infamous question, "Where is Jessica Hyde?" Unfortunately, the answer to that question is "in the hands of the Network" given that the mysterious Mr. Rabbit was actually MI5 agent Milner (Geraldine James), who captured Jessica (Fiona O'Shaughnessy) when she tried to surrender the manuscript. The secret to the Janus virus was not actually in the papers though - it was somehow hidden in Jessica's blood by her father so many years ago. 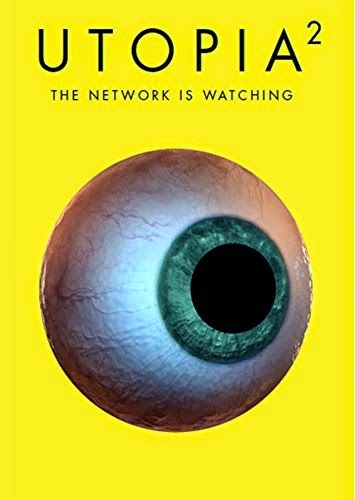 The first episode in the series was actually one long flashback that shows us just how Philip Carvel (Tom Burke) first got involved with the Network and initially helped them to create the Janus virus. Back in the present day, we see the different survivors of the first series trying to find a new life. Wilson (Adeel Akhtar) is now working for the Network given his belief that their desire to create a better world by killing off most of it was a noble one. Ian (Nathan Stewart-Jarrett) and Oliver (Grant Leeham) now live together as they try to hide from the Network. But Nathan continues to obsess about Becky (Alexandra Roach), who in turn is trying to find a cure for her Deel's syndrome. The first episode of the show rather threw me off guard. The trailers for the show get you all prepared for a return to the action in terms of where we left off in the first series. But instead we sort of had an almost cold opening with the flashback that lasted the entire episode. But don't get me wrong, that turned out to be a phenomenal episode in itself that revealed so much about the origins of Janus and of course the beginnings of Milner's manipulations. Of course by the second episode we're right back at it, but now armed with a better understanding of all that had come before. And I suppose that first episode helped setup the fact that Carver and his work would be front and center in terms of the flow of the story this time around. But what it doesn't prepare you for is just how different the status quo is with "good guys" like Wilson now working with the Network and even "bad guys" like Arby (Neil Maskell) suddenly on the side of angels. And its this ability to break out of narrative stereotypes and push the story in new directions that really makes this show great. Overall, it's actually had to see the characters in the show in terms of simplistic categories of good and bad. If anything, everyone is just another shade of gray. You can't totally fault the Network for wanting to purge the planet of so many people - they're working under the very realistic assumption that humanity is going to kill itself through wanton consumption of natural resources in an irresponsible manner. Our little rebels ultimately just want to stay alive, but they also can't comprehend the number of deaths that the Network plan to take and thus rely on basic human deceny to guide their actions. Is one necessarily better than the other? And what about Peter Carvel and the changes he introduced into Janus virus to make it work in ways that not even the Network understands? Does that make him a hero or a villain? I don't know how, but the show managed to keep the tension just as high (or even higher) than in the first series with the same level of visual art woven into each scene and shot. The characters remain complex and fully developed and their motivations laid out for us viewers to see. By the end of the series, the show once again leaves you with more questions than answers and so many possible directions to take the narrative. Utopia is a singular television drama experience that I wish could get more attention but probably just zips well over the heads of others. I continue to strongly recommend this show to you geeky readers - the show is just brilliant. And so I still rate the show as a solid 5 stark colored bags full of implements of torture and murder out of a possible 5.